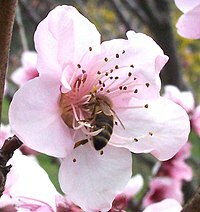 A honey bee collecting nectar from an apricot flower. The nectar resource in a given area depends on the kinds of flowering plants present and their blooming periods. Which kinds grow in an area depends on soil texture, soil pH, soil drainage, daily maximum and minimum temperatures, precipitation, extreme minimum winter temperature, and growing degree days. The plants listed below grow in USDA Hardiness zone 5. A good predictor for when a plant will bloom and produce nectar is a calculation of the growing degree days. Hopkins' Bioclimatic Law states that in North America east of the Rockies, a 130 m (400-foot) increase in elevation, a 4° change in latitude north (444.48 km), or a 10° change in longitude east (two thirds of a time zone) will cause a biological event to occur four days later in the spring or four days earlier in the fall. In botany, the term phenology refers to the timing of flower emergence, sequence of bloom, fruiting, and leaf drop in autumn. The classification in major or minor nectar source is very dependent on the agricultural use of the land. An agricultural crop such as canola or alfalfa may be a major or minor source depending on local plantings. Generally, the more diverse a forage area is, the better for a stationary apiary. Urban, suburban and areas not under cultivation provide more consistent warm-season nectar forage than areas that are heavily cultivated with only a few agricultural crops. The nectar sources from large cultivated fields of blooming apples, cherries, canola, melons, sunflowers, clover etc. benefit a bee keeper who is willing to travel with his hives throughout the season. Honeydew sources are not included in this listing. S Blueberry Vaccinium corymbosum, Vaccinium angustifolium, Vaccinium pennsylvanicum 5 6 no. Honey amber and of good flavor. cultivated minor in most areas. Strong colonies may store 50–90 pounds of surplus from it. F Milkweed Asclepias spp. 55 species Perennial 7 8 feral All species are great for honeybees. Nectar is so abundant that it is possible to shake the blossom and actually see the nectar fall. major – 120–250 pounds honey, depending on soil and if good fertilization Asclepias syriaca has the highest honey yield. F Viper's Bugloss, Blue thistle, Blue weed Echium vulgare Echium vulgare is most widely known, though there are about 60 additional species. Perennial 6 8 no feral In California, spring blooming plant with repeat bloom. Fall bloom provides nectar for bees for overwintering. The most unusual feature of Echium vulgare is the protection of the nectar inside the flower from vaporization (when it's hot) or flushing away (when it rains). It is why almost for 2 months this plant is a stable source of nectar for bees. Additionally this plant produces nectar throughout the day unlike most plants which produce nectar for a short period of time. If the bees have a good access to Echium they can collect between 12–20 lbs of nectar a day. The concentration of sugars in the nectar vary 22.6–48.3% depending on the quality of the soil, and not on the amount of rain. The honey is light amber in color and very fragrant with a pleasant taste, and does not crystallize for 9–15 months. major – 300–1,000 pounds honey/acre depending on soil. 500–2000 lbs of dark blue pollen. F Blue vine Gonolobus laevis Perennial no. Honey is clear, heavy bodied of excellent flavor. feral minor; Strong hives can collect up to 100 pounds. C, F Phacelia, Tansy Phacelia tanacetifolia Perennial Western US – One of the best spring forage sources for honeybees. Blooms 45–60 days and continuously produces nectar throughout the day. Can be seeded several times per year. Prefers three feet of topsoil. 180–1,500 pounds honey per acre, depending on soil quality and depth; 300–1000 pounds of pollen. A honey bee on Sweet autumn clematis in September. Honey bee on Sedum 'Autumn Joy' (Hylotelephium telephium). Two Bees on a Creeping Thistle Cirsium arvense. ^ Zhiliang, Pan (Summer 1997). "Bee Visitation and Nectar Production of Anise Hyssop" (PDF). Department of Plants and Soil Sciences, University of Massachusetts. ^ "A Selection of Bee Forage Plants" (PDF). Spikenard Farm Honeybee Sanctuary. This page was last edited on 12 September 2018, at 19:07 (UTC).